A drained car battery is one of the most frustrating things that can happen to a driver. Forget about heading to the office, the store or school to pick up the kids – you’re going nowhere. Whether you’ve left your lights on, your engine ticking over or the battery itself is old/faulty, it’s a useful skill to know how to jump start the battery. Read on for our 10-step, easy to follow guide to jump starting a car battery. Before you even think about a jump start, it’s essential you establish whether or not it’s the battery that’s at fault. Firstly, check your external lights. If they’re dim, the battery could be the problem. Next, turn on the ignition. If it cranks slowly, the battery is likely the problem, but if it turns over quickly there could be a bigger problem. Once you’ve established the battery needs a jump, it’s best to get everything you need in one place. Locate your jumper cables, adorn protective gear (gloves, overalls, etc. ), remove any accessories from the cigarette lighter or CD deck, and create a clear working space. It’s best to place vehicles as closely together as possible before attempting to jump start the battery. Line the vehicles up hood to hood with about a foot between them. Next, open the hood on both vehicles and secure them in the open position. Locate the battery in each car. Take your positive (+) jumper cable and attach it to the positive (+) terminal on the DEAD battery. Once attached, connect the other end of the cable to the positive (+) terminal on the GOOD battery. Note: the positive jumper is usually RED. Take your negative (-) jumper cable and attach it to the positive (-) terminal on the GOOD battery. Once attached, connect the other end of the cable to the negative (-) terminal to a piece of grounded metal on the dead car, preferably a non-oiled nut or bolt. Note: the positive jumper is usually BLACK. Before moving on to the next step, ensure each jumper cable is clear of each engine’s moving parts, ensuring they won’t be snagged during the jump start. On the vehicle with a working battery, turn on the engine and leave it to idle for 60 seconds. Rev the engine at intervals of about 20 seconds. Turn the engine off after the allotted 60 seconds. Turn the ignition key and see if the engine comes to life. If the battery jump start has been successful, the engine will start as normal. If it does not, turn the engine off and check the cable connections. Slight adjustments can create the necessary connection to start an engine, but remember to connect the cables in the order stated above. Repeat the above steps if necessary. While knowing how to jump start a dead battery is a useful skill, sometimes it’s a better idea to let the professionals handle it. After all, jumping a battery can be a tricky, not to mention risky, prospect. 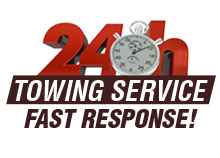 If you’d rather a professional took care of the jump start, Towing San Diego offers professional jump starts at an affordable price.